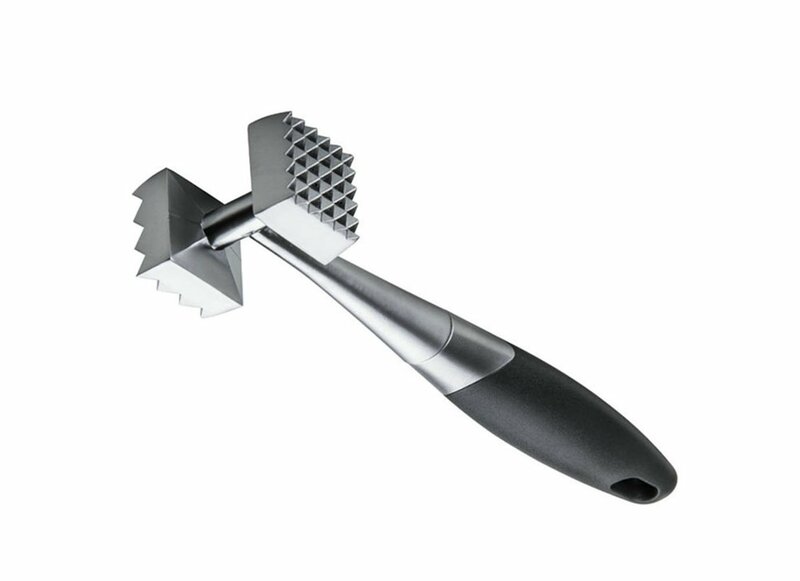 Use for tenderizing or flattening chicken, beef, pork, or venison. Also use to crush nuts,ice & hard candy with ease. Soft handle absorbs pressure,Oversize handle and finger indents give a great hold without strain. A hanging loop on bottom helps to save space of storage. Fits in kitchen drawer or hangs on a hook. Size: A | Color: Black Use flat surface to pound meat into uniform thickness and promote evencooking. Soft handle absorbs pressure , ergonomically designed to fit perfectly forright or left hand use. Oversize handle and finger indents give a great hold without strain and keepshands clear of the tool's functional surface. Made of heavy duty cast Zinc alloy,durable.Hand wash only.